Leaders Lab / The Organisation Itself / 6 top tips for making organisational change stick! 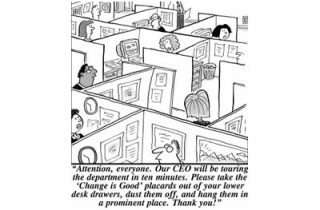 6 top tips for making organisational change stick! …your projects, announcements and events to emphasise the integration of practical change – restructuring, new systems, office moves etc, and cultural change – mindsets, values, attitudes etc. Separating these is common practice and a common reason for the failure of business transformation. For example, include in your Six Sigma workshops, restructuring announcements or SAP training an opportunity for people to express their concerns and fears. Include in your vision and strategy communication to your staff the opportunity for them to play with the ideas and to contribute their own version of how they would like to contribute to the effort. Consider running separate events for key teams to consider the consequences of new initiatives in their own work area. When listening to people’s opinions, concerns and complaints, resist the temptation to argue, persuade, reassure and generally provide solutions that come from your mindset and your view of the world. People’s concerns and opinions only turn into resistance if they are not heard and respected. You’ll be surprised at how quickly people’s mindsets can shift, if you respect them and give their concerns some attention. …what you want others to be and do. As a leader you are the best source of learning and adaptation to change in your organisation. Don’t make promises, especially early in the change process, that you’re not sure you can keep. Once trust is gone, it’s very hard indeed to rebuild. …as often, and in as many ways, as possible. Tell as many people as you can what the key changes are, the intention behind them, and the reasons for them. If they complain they don’t know what’s going on, it’s down to you! …especially early on. Let everyone know about great results and recognise those who made them happen. How well do these tips work in your company?